Richard and Rhoda were enumerated in the 1880 Italy, Yates Co., NY, federal census. He was a farmer, age 36, she was 35. Children in the household were Rosina 11, Edwin 11, Ellis L. 7, Eva L. 7, and J. Dana 5. Also in the household were sister-in-laws Phebe McConnell 50, and Annie McConnell, 32. [S792] Barbara Lambert Merrick, Elder William Brewster, page 321. [S792] Barbara Lambert Merrick, Elder William Brewster, page 161. [S792] Barbara Lambert Merrick, Elder William Brewster, page 323. [S792] Barbara Lambert Merrick, Elder William Brewster, pages 80, 156. [S792] Barbara Lambert Merrick, Elder William Brewster, page 80. [S792] Barbara Lambert Merrick, Elder William Brewster, page 156. [S792] Barbara Lambert Merrick, Elder William Brewster, page 53. [S467] Judith Kay Price, "Judith Kay Price," e-mail to James H. Holcombe, 18 October 2003. [S182] Social Security Death Index (on-line), Ancestry.com, SSDI, Ancestry.com, SSAN 286-12-5570. E.W. is only assumed to be a son of Virgil because he is enumerated near Virgil in the 1850 census. E.W. and Mary Ann were enumerated in the 1850 York, Washtenaw Co., MI, federal census. He was a merchant, age 35, born in NY; she was 33 born in NY. Children in the household were Sarah Ann 10 born in OH, Alice 8, Henry W. 5, William 4, and Milo 2. The last four all born in MI. Justin is only assumed to be a son of Virgil because he is enumerated on the same page in the 1850 census. Virgil and Henrietta were enumerated in the 1850 Milan, Monroe Co., MI, federal census. He was a farmer, age 25 born in NY; she was 18, also born in NY. There were no children listed. Seymour is only assumed to be a son of Virgil because he is enumerated on the same page in the 1850 census. Seymour and Ann were enumerated in the 1850 Milan, Monroe Co., MI, federal census. He was a laborer, age 23, born in NY; she was 24, also born in NY. The only child in the household was Albert N. 1 month. Jennie S. Phillips married Thomas T. Loomis on 25 May 1881 at Racine, Racine Co., WI. 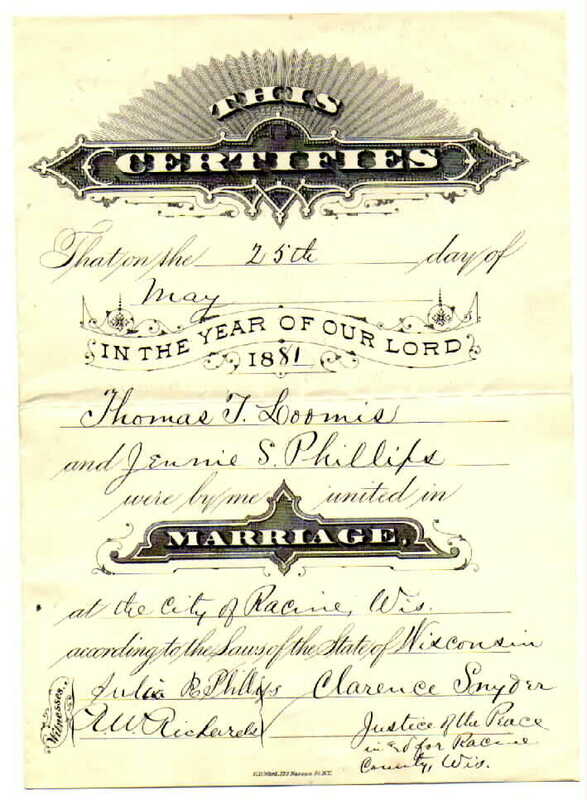 Thomas T. Loomis married Jennie S. Phillips on 25 May 1881 at Racine, Racine Co., WI. Isaac Morgan was born circa 1801 at Griffithshire, England. He married Mary C. Brasher in 1828. Isaac Morgan died on 16 December 1884 at Williamson, NY. Mary C. Brasher was born circa 1811 at Devises, England. She married Isaac Morgan in 1828. Mary C. Brasher died on 8 July 1884 at Williamson, NY. Clarence Fitch married Florence Maria Waring, daughter of John Augustus Waring and Helen Maria Humphrey. Waring James Fitch, 82, of Port Townsend died Friday, March 10, 1995 at the family home after a long illness. a memorial service is set at 2 p.m. Friday, March 17 at the First Presbyterian Church in Port Townsend. Mr. Fitch was born in Cleveland, Ohio, Dec. 29, 1912 to Clarence and Florence Fitch. He graduated from Michigan State College and received his master's degree in special education from the University of Michigan. He was a teacher of the deaf and hard of hearing at Rochester, Minn. and Winona, Minn., where he met Mary Anne Griffith, who was a fellow teacher. They married June 21, 1941. Waring worked with war-deafened persons during World War II in Checkasha, Okla. After the war he became a teacher in the English Dept. at the University of Michigan. The couple moved to Seattle in 1949 to head the state training program. In 1960 he became the first director of Special Education for Highline School District. From there, he was appointed the Seattle School District's supervisor for special education for hearing impaired. Owning a summer home in Brinnon introduced Waring and Mary to Jefferson County. In 1968 Waring was hired as the Port Townsend School District's special education instructor specifically to work with the deaf and hard of hearing. He retired from teaching here in 1974, although he worked one year to establish an Easter Seal hearing program in the island of Maui, Hawaii. He also co-authored a book, "Hearing Therapy for Children." Mr. Fitch is survived by his wife, Mary, in Port Townsend; daughters Catherine Lucille Farrar and Nancy Beth Mershon, both of Seattle; a brother, Steve Fitch, Palo Alto, Calif; and three grandchildren. Friends remember Waring Fitch as a "gentle and kind man," his wife said. He was a life member of the Washington State Hearing and Speech Association and the first Presbyterian Church of Port Townsend. He liked to travel and garden. Memorials may be made to First Presbyterian Church or to Hospice Port Townsend, in care of Jefferson General Hospital. [S470] Leader, 15 Mar 1995. John and Frances were enumerated in the 1930 East Cleveland, Cuyahoga Co., OH, federal census, ED 599. He was an accountant at an electrical co., age 32; she was 30. The only child in the household was Robert J. 1 month. Brother Waring, age 17 was also enumerated in the household.